I know it’s beyond Wednesday, so this week is practically over. But, I just wanted to share with all of you my experiences from last weekend! So, Friday, October 18th, one of my best buddies and I left Holland, MI and road-tripped to Ann Arbor, the home of the University of Michigan main campus. I’m going to be honest, I love U of M. It was in my top 3 choices my senior year of high school. When Joey and I arrived there, it was around 10:00 PM, because we made a pit stop in Howell, MI to do some outlet mall shopping. I was actually disappointed with the selection and even the prices, but that’s what’s not important! We ended up staying the night in Ann Arbor. We needed all of the energy we could reserve for the big football game! The football game started at 3:30 PM, so Joey and I slept-in a little, and we did a little tour of the HUGE campus. We ended up in downtown AA where we ate at Noodles and Company and shopped at the MDen, the official supplier of Michigan apparel. That store was packed beyond I could imagine, and I even heard from the locals that it’s that way all of the time. Crazy to think, right? 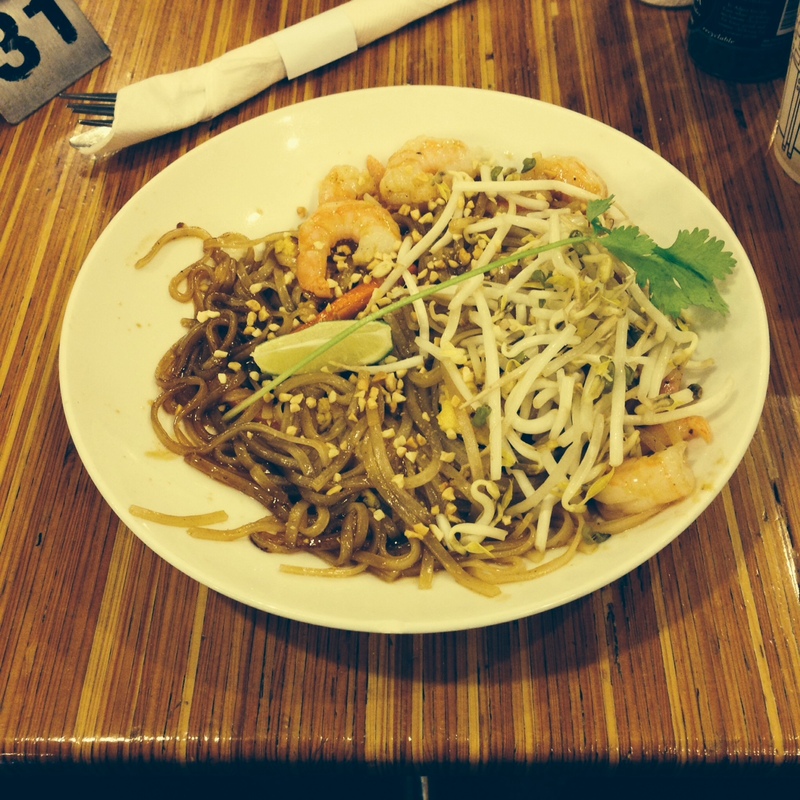 Whenever I go to Noodles and Co., I ALWAYS get the Pad Thai. I would recommend it. Just touring around South Campus was so overwhelming for me. Although this trip was such an awesome experience, it made me realize how lucky I am to be at Hope College. When you think about, we are very spoiled as students at Hope! We get the attention from our professors, they know us on a first-name basis, they care about our success, and Hope is just a closer, tight-knit community. Of course, the big universities have so many things to offer, but so does a small-liberal arts college. Here are some of the pictures I took from this weekend at U of M. Take a peek! For the seniors, and even juniors in high school, hear me out! The size of the college you want to go to will matter! Think about the faculty to student ratio. Glance at the average class sizes. DO YOUR RESEARCH! At Hope College, we pride our faculty to student ratio and class sizes. You will get all of the attention you need. The small class sizes truly enhance your learning. For me, I feel super comfortable asking my profs questions, which furthers my learning. Big universities do offer financial aid, but for many, they’re only given such a limited amount. Again, Hope College prides itself in financial aid packages, making school affordable for all students. Yes, ALL STUDENTS. Hope College also offers various academic scholarships and grants. Let me tell you, I’m SO glad I came here. This is also what drew me in. I know you are thinking about college, but it’s also a time to think about post-college education. Hope College prepares all of its students for graduate school. Hope offers many pre-professional programs that can get you in the door. Hope is also very distinct in research. It is ONE OF THE BEST undergraduate research schools in the NATION. Yes, NATION. Want proof? Click here! Hope has an atmosphere that you won’t see anywhere else. The campus is both small and large. You can cross campus in at least 10 minutes, but the student body is at the perfect size. You will recognize others, but not know them necessarily. I know I keep yapping but Hope just has so much to offer. As you approach deadlines for applying to schools, consider Hope. Click here to go their admissions website to learn even more. Hope offers many visit-day opportunities, fly-in weekends, and even crossing Lake Michigan on a ferry to accommodate those living out of state! I know I’ve been yapping for a long time now. But consider your options. Hope is here for you. Take the visit days to your fullest advantage. You’ll be glad you did. Seriously, this college rocks.